Preheat oven to 325°F. Bring meat to room temperature and season with salt and pepper. Dredge the beef in the flour. Heat a large Dutch oven to medium-high heat and add oil, 2 turns of the pan. When oil smokes, add meat in batches and brown evenly; remove to plate. Add onions and garlic, and stir 5 minutes. Add paprika, caraway seed, cumin, salt and pepper. Stir to toast the spices a minute. Add stock, bring to low boil, then add carrots, parsnips and celery. Slide beef back into pot and transfer to oven for 2 hours. Stir in tomatoes, peppers and onions, and return to oven to cook 25-30 minutes more. Remove goulash from oven and stir in herbs. Pass with crème fraîche at the table for topping. In Recipes-list.com we have selected the most viewed recipes from category - uncategorized . Enjoy the best recipes specially selected for you! 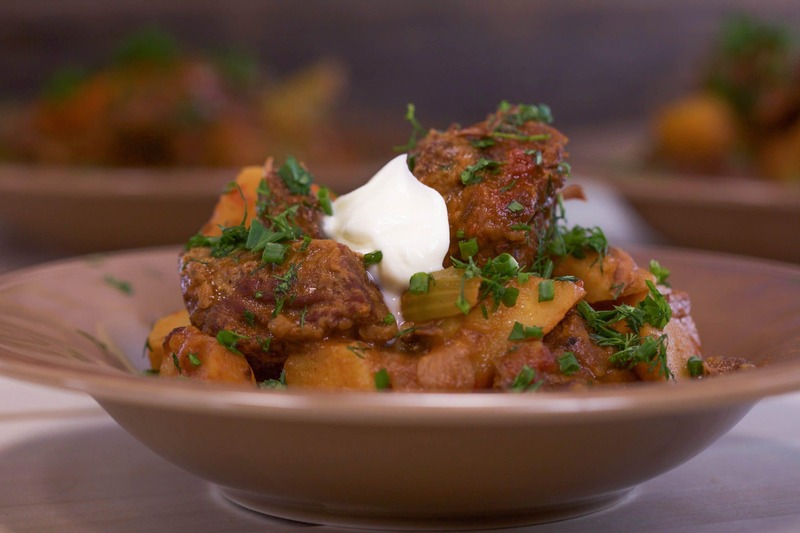 Beef Goulash is the right choice that will satisfy all your claims.